Amazon.com lists the price for a used copy of out-of-print short-story anthology "Best in Show: Fifteen Years of Outstanding Furry Fiction" as $348.33 – plus $3.99 shipping. 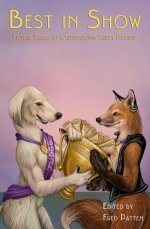 "Best in Show" won two Ursa Major awards for 2003, for Best Anthropomorphic Other Literary Work and Best Anthropomorphic Published Illustration. Ed: The anthology was reprinted without interior illustrations as "Furry! : The World's Best Anthropomorphic Fiction", currently available for a far more reasonable $6.09. Perhaps it is the result of automatic pricing algorithms stuck in a feedback loop. I would like to know what are those stories like. I read His Dark Materials, Crime and Punishment, Master and Margarita, Angels and Demons and Harry Potter 1-7 (among many other things), so I expect high quality writing. I paid almost twice the current asking price for Furry! and I believe I got my money's worth. Take that as you will. WikiFur links a couple of reviews and lists the stories and their authors. And they say everyone online is "antisocial"... Sometimes a link or two can be of great help; and helping is a purely social trait. However... never judge a book by its cover..er.. binding right? The worst thing (aside from the price of the original) is the fact that there are no illustration in the new edition.